We are delighted to announce that Kids Yoga is coming back to Yoga Kula on Wednesdays and Thursdays at 4:15-5pm, term time only. Our Wednesday session for age group 4-8 will be taught by brand new teacher Kate Herrick and our Thursday session for age group 9-12 will be taught by Susanne, who already teaches Restorative yoga at Yoga Kula and specialises in Yoga Thai Massage. 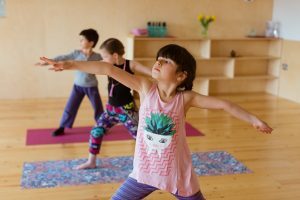 To celebrate Kids Yoga coming back to the Yoga Kula timetable we are running two free taster sessions on Wednesday 12th October and Thursday 13th October both at 4:15pm for 45 minutes. If you are interested in your children starting Kids Yoga, why not pop down to the taster day to try it out. Please note booking is essential. Starting yoga at a young age means we develop a sense of stillness and calm, we begin to observe our emotions and decide if we are going to react or just let it pass by. This is such an important skill growing up as we learn not to be consumed by our thoughts and feelings and that instead we can begin to understand their temporary nature. They arise and pass away and we may feel differently tomorrow! When we understand this we can choose not to react all the time and live in a more calm and peaceful way. It’s great to learn yoga early to help us gather physical and mental strength and to grow our confidence. 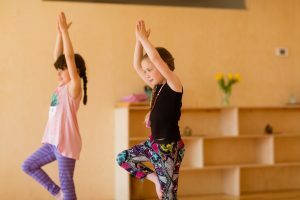 Kids Yoga is non-competitive and playful so it suits all children! To book your place on the Thursday 13th October age 9-12 taster day please follow this link: Kids Yoga Taster Thursday.